Now is the time to register to take advantage of early registration rates! Make sure to book your accommodations after registering to get all the benefits of staying in an official Nutrition 2019 hotel. 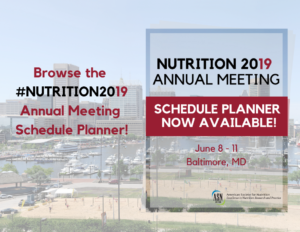 Nutrition 2019’s Scientific Program and Schedule is Available! 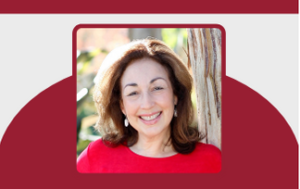 Nutrition 2019 will feature more than 100 sessions covering 6 tracks so you’ll get the knowledge and skills you need on the topics you want. Hear experts weigh in on hot areas such as nutritional microbiology, big data analytics, nutrition-related health effects of cannabis, animal protein sources, meal timing and circadian rhythms, omics in nutrition, delivery of micronutrients to populations and much more in our featured symposia. Explore our preconferences and sponsored satellite programs spanning content from sports nutrition to sustainability of the food supply. Drop in the From Research to Practice clinical programming to hear the latest on practice-changing science. Network with leaders from federal agencies in our Connect with the Fed activities. Brush up on skills in one of our professional development workshops. Learn more about programming and events at Nutrition 2019. Want to learn more about exhibiting or being a sponsor at Nutrition 2019? Do you know of any colleagues who should have a presence in Baltimore? Nutrition 2019 provides investigators at all career stages with invaluable opportunities to interact with representatives from federal agencies. Want to learn more about federal nutrition research funding opportunities? Or, get the skinny on the peer review process with a Scientific Review Officer? Meet the people behind the National Health and Nutrition Examination Survey? 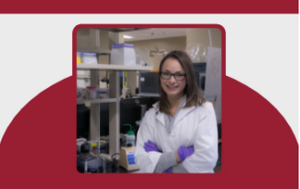 Don’t miss these unique opportunities tailored specifically for nutrition scientists! 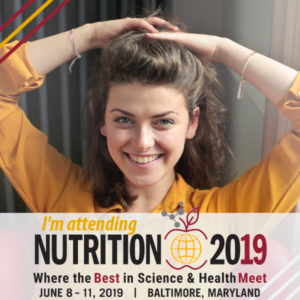 Add the official Nutrition 2019 Facebook frame to your profile picture to show the world that you’re attending the #1 nutrition science meeting this June! Click here to add it to your profile. Are you attending Nutrition 2019? There’s a frame just for you! Are you a student or early career professional? The Nutrition 2019/FASEB “Diversity Resources for Enrichment, Access & Mentoring” (DREAM) Mentored (formerly called MARC) Travel Award offers up to $1000 in travel support. For full eligibility details, please click here. To be considered, you must meet the eligibility guidelines, submit an abstract by January 18, and complete the application by April 15. Click here to complete the application. Travel awards are open to all groups including, but not limited to, underrepresented groups. Trainees funded by NIH F, K and T awards are eligible to receive travel support from FASEB. Submit an abstract by February 15, 2019. Click here to submit an abstract. “Nutrition 2018 offered scientists an opportunity to network and exchange new information conveniently. The planning and location of the conference was optimized to provide an environment to easily access talks, posters, sessions and workshops”. “Nutrition 2018 proved to be an invaluable learning experience, especially for a graduate student like myself. Being immersed in an environment with fellow students and established scientists allowed for thorough discussion of new research areas and differing perspectives. I arrived in Boston excited for the conference events to follow, and I left with an even greater motivation to continue pursuing research in this growing field”.